By far one of the most planted food plot species is clover. For many, clover is clover. But between reds and whites, annuals and perennials, there are a lot of differing characteristics that not only affect the performance of a food plots but also the cost of establishment. Many will opt to plant a Durana or Ladino white clover in their standard annual food plot mix because of the larger leafed biomass produced, only to till it under next summer/fall. As a perennial, white clover can be maintained as a highly nutritious and attractive plot for several years. The same can be said for alfalfa and chicory. Mixing these plants with annuals is not a bad idea, as annuals provide “cover crop” like protection to the slower growing perennials. However, the plot should then be maintained year after year allowing the perennial to thrive, not tilled under to plant another annual plot less than a year later. In order to maximize your investment with perennial plantings, here are some simple tips. Because they have a longer lifespan, perennials will grow slower than annuals like oats, wheat or rye grain. In areas of high deer populations or plots smaller than one acre in size, it’s often a good idea to plant them with an annual. This provides cover for the slower growing perennial from heavy deer browsing and allows it to establish before deer pressure really starts. For the first deer season, it will also provide a buffet of forages at varying attractiveness. A food plot is only as good as its foundation – the soil. For most, this means throwing out some lime and a bag or two of “Triple 13.” Though anything will help, this is likely not going to get it done. Though pH (parts Hydrogen) typically has the greatest focus, nutrients in the soil are often just as limiting. There are lots of options for neutralizing materials from pelletized lime to new bio-activated calcium from DeerGro. For many, moving tons (literally) of lime is impossible, or co-ops are more concerned with large scale farming to bring you a couple of tons. Nutrients are very critical, mainly Calcium, Nitrogen, Phosphorus, and Potassium. A proper soil test will get you the answer to the pounds per acres of each that you need to grow a great plot. Unlike annual plots that require little attention after planting to reach maximum performance, perennials will require attention, but that translates into years of production, versus months with annuals. Most of this revolves around the control of grasses and weeds, but also some additional or released fertilizer. 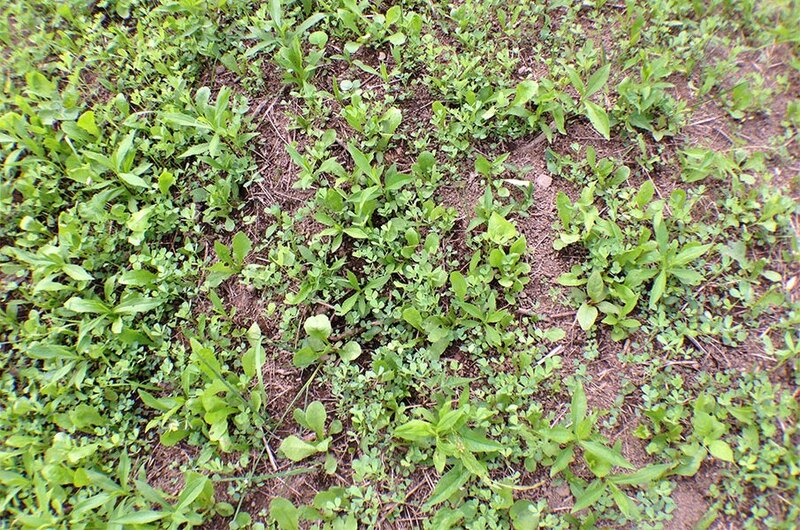 For weeds, most perennial plots will have a constant battle with grasses. Use of a grass selective herbicide with the active ingredient clethodim can cure that problem. Release from competition will allow the plot to flourish year after year. Though it may seem like “extra” work, the amount of production and benefit from perennial food plots will create a multi-year nutrition and attraction source on your property.